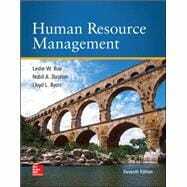 Human Resource Management continues to present the theoretical and practical aspects of HRM. The theoretical material is presented throughout its pedagogically-effective examples woven throughout, while the practical aspects of HRM are presented through its adaptive learning program, Connect. This edition reflects the challenges of diversity, technology and globalization in the business world and how these forces impact the HRM function within organizations.